Dr. Nithya Shankar joined the School of Business & Economics in fall 2016. Dr. Shankar recently earned her Ph.D. in Marketing from the Rensselaer Polytechnic Institute (RPI). 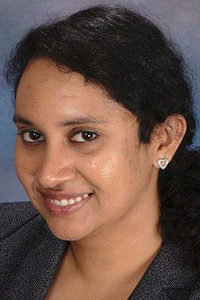 She also holds a Master of Science in Information Technology from RPI and a Bachelor of Engineering in Computer Science and Engineering, from Anna University (India). While pursuing her master’s degree, she spent a summer in Silicon Valley interning with eBay, Inc. as a project manager in their Global Product Planning team. Subsequently, she accepted a full-time position with PayPal, Inc. as a project manager in their Global Operations team, based out of Austin Texas. She left PayPal, Inc. to pursue her doctorate and, ultimately, a career in higher education. Dr. Shankar’s research focuses on marketing-finance interface, consumer behavior, and branding. She was an American Marketing Association (AMA) Sheth Doctoral Consortium Fellow in 2014. Her most recent presentation was at the INFORMS Marketing Science Society Conference, 2014, “CEO Optimistic Overconfidence, Firm Resource Allocations and Firm Performance.